The add-on allows editing invoices and packing slips using drag-and-drop blocks and powerful visual editor. You can create your own templates of invoices and packing slips, set different templates for customer user groups, add and arrange information in a necessary way within the add-on. Admin is also able to edit invoice/packing slip in the visual editor before printing documents for the particular order. 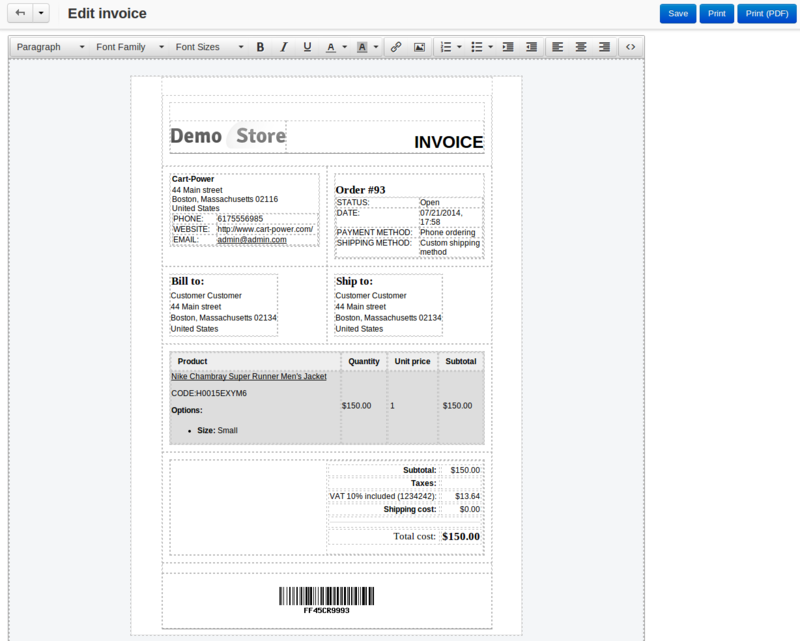 The add-on has default pre-set templates for Invoice and Packing slip. 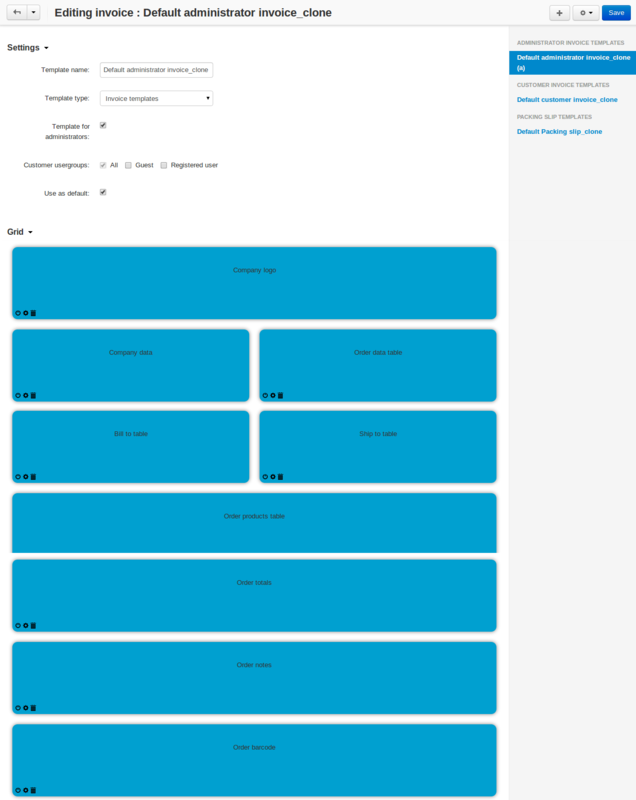 It makes easier for an administrator to manage his own templates. This is a great addon to change your bills and create multiple templates. 1- How I can add the invoice number to the template? so far not found a way to do this, and I can just add the order number. 2- How can I restore the original template if I disable the addon? PS: What a nightmare your captcha!!! Harry, the purpose of the invoice editor is to provide administrator with an easy way to modify the invoice template. Add there additional information, links, text etc.. If you require any additions to the add-on, it doesn't mean that it is not making what it should. Just contact us and we will do our best to help you. 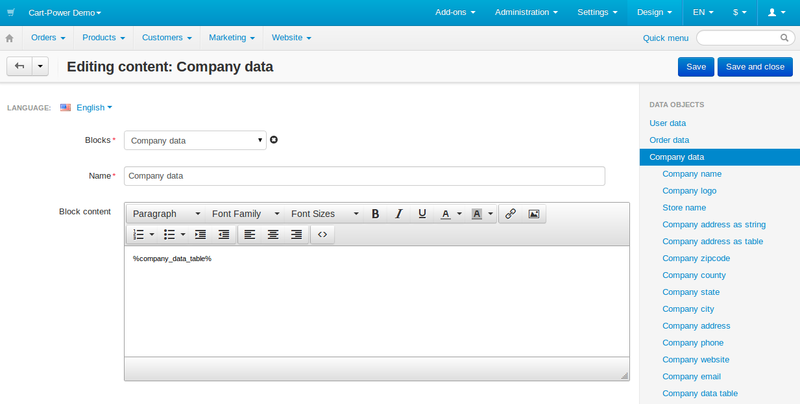 You can write all your suggestions in a special form, that you can find in the footer of our site. We will take them into account and include in the next versions. If the invoice is modified is there a way to add the date and time it was modified along with the original date it was written. I would like this done automatically each time the invoice is modified. Unfortunately, there is no such feature in the current version of the add-on. We can develop it for you if you wish. Please, contact us if you are interested.